These are not the best of times for old-school restaurateurs. Costs are high, the once-faithful clientele are more fickle than ever, and all the big money, as Danny Meyer will probably tell you, is in the mundane, fast-food world of burgers and fries. But in his little corner of the West Village, Gabriel Stulman has built an impressive dining empire in a short time by doing things the traditional way. Like Meyer and Keith McNally, he has a knack for divining new trends and for recruiting talented young cooks (the Montreal nose-to-tail chef Mehdi Brunet-Benkritly at Fedora, Michael Toscano at Perla). He’s a tireless and happy glad-hander in the Meyer and Sirio Maccioni style, and like those masters of the game, he spends his evenings spinning among his different ventures, handing out menus, cajoling cooks in the kitchen, and slapping his regular customers on the back. The new Chelsea brasserie Montmartre is the sixth addition to Stulman’s Little Wisco restaurant group in four years (and his second in four months), and it bears all the trademarks of his now-familiar style. 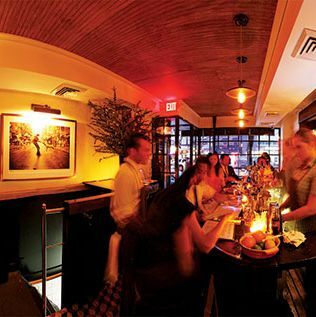 The warren of dining rooms on Eighth Avenue are small and tastefully appointed (you’ll recognize items from the walls of other Wisco restaurants), and each room tends to grow raucously noisy as the tables fill with a steady stream of revelers sporting muttonchop whiskers and porkpie hats. The chef, Tien Ho, opened Má Pêche for David Chang, and like Stulman’s other cooks he seems poised for his moment in the sun. Retro brasserie cooking is all the rage these days, and the restaurant’s original menu featured classics (blanquette de veau, cassoulet for two) with trendy, fusion-­leaning creations like Vietnamese pot du crème and side orders of sticky rice studded, in the Chang style, with chunks of caramelized pork. When it was first announced, the Tien Ho-Stulman collaboration was considered by some excitable gastronomes to be a marriage made in restaurant heaven, like Danny Meyer and Tom Colicchio in the old days, or a raffish, downtown version of Sirio Maccioni and Daniel Boulud. But the early stages of this celebrated partnership have not gone smoothly. Ho’s interpretations of the French classics were greeted with mixed reviews by early critics. On my first visits, the blanquette de veau was thin and watery; the strange, deconstructed cassoulet was barely palatable (it featured, for the record, a giant braised lamb neck); and the Vietnamese pot du crème tasted, according to one shocked Francophile at my table, “like old plastic car seats.” Six weeks after opening, Stulman abruptly announced that he was scrapping many of these traditionalist experiments and focusing on the more fusion-oriented approach, which, it was hoped, would better showcase Ho’s talents. I’m happy to report that the latest menu at Montmartre does a better job of this than the original one, although there’s still a sense, here and there, that the kitchen is straining to live up to all the hype. The original, soupy house version of cod brandade was served in a crock, like onion soup, but now is mixed with potatoes and served with dabs of chile jam on sections of country toast. You can complement your cod toast with mashed chicken livers touched, not unpleasingly, with white miso (also on toast), and a version of eggplant caponata that comes with a tangle of cassava chips. The elegant kale tart ($12, with a twirl of anchovy on top) is still my favorite saladlike appetizer, and if you’re looking for something more robust, avoid the McNugget-like crispy rabbit torchon in favor of the grilled quail ($17), which is plated, in the North African style, with apricots, couscous, and a spoonful of spiced yogurt specked with crushed almonds. of flageolet beans flavored with bacon and a tart honey-and-cider jus. Best of all, though, is the Vietnamese-American chef’s inspired Franco-Vietnamese creation called pot-au-phô ($44 for two), which is presented in a bowl brimming with braised short ribs and shreds of rosy pink sirloin, all slowly cooking down with star anise, scallions, and fronds of coriander in a richly fragrant oxtail broth. Dishes like this make the party atmosphere, which Stulman cultivates at all of his popular, famously tiny establishments, a little more bearable toward the end of the evening, when the decibel level picks up and the crowds pack in to the pint-size dining rooms. As usual with a Stulman joint, the drinks are professionally made and humorously named (try the lethal Rye ’N Parker Swag). The generally well-chosen wines (French and U.S. only) occupy that tasteful mid-range price point somewhere between $40 and $90. The latest crop of modest, ready-made bistro-style desserts is much improved over the grim, mercifully discontinued Vietnamese pot du crème. They include a classic mille-feuille, constructed with layers of elegantly light pastry crust (the chocolate filling is tinged with Vietnamese coffee), coconut rice pudding topped with caramelized bananas and bits of jackfruit, and a freshly baked apple pie poured with a classic crème anglaise touched with a sweet hint of bourbon. Hours: Dinner Sunday through Wednesday 5:30 to 11 p.m., Thursday through Saturday till 1 a.m.
Prices: Appetizers, $8 to $17; entrées, $23 to $78. Ideal Meal: Cavolo-nero (kale) tarte renversée, pot-au-phô for two, apple pie. Note: The tiny bar is an impossible place to eat, so if you’re looking for a little peace and quiet, ask for a table downstairs. Scratchpad: One star for the infectious atmosphere, and another for the promise of more dishes like the pot-au-phô.